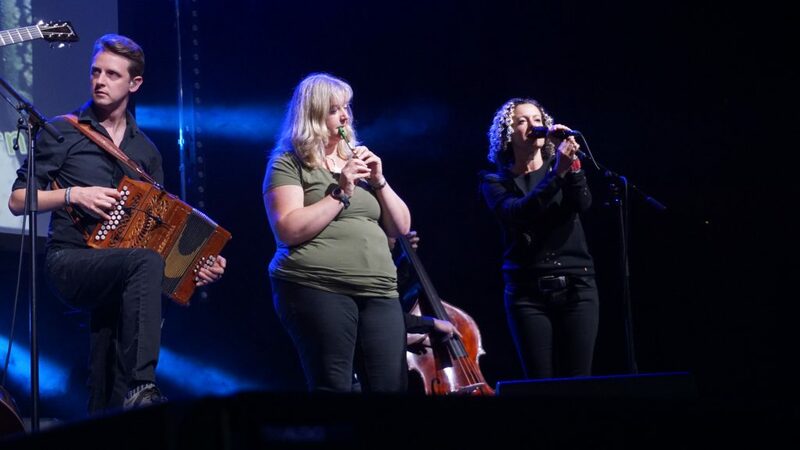 Underneath the Stars is a festival of celebration of Yorkshire’s music scene and the grand tradition of Kate Rusby, but more importantly it is an olive branch, nay, an olive tree that gives a platform to several well-known and upcoming groups wherever they hail from. A generous enterprise indeed. Our festival visits continue and this time we cast our eye on “Underneath the Stars 2018”, one of the jewels of Barnsley’s music scene calendar. But does it glimmer in the light? 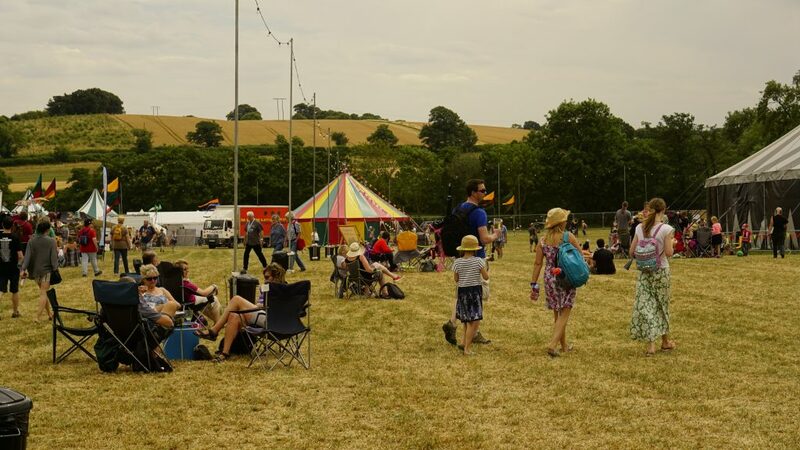 Now in it’s fifth year the festival is a a relaxed bustle of international musicians across genres, extensive and friendly children’s entertainment, excellent craft and food stalls and of course a series of musical workshops. 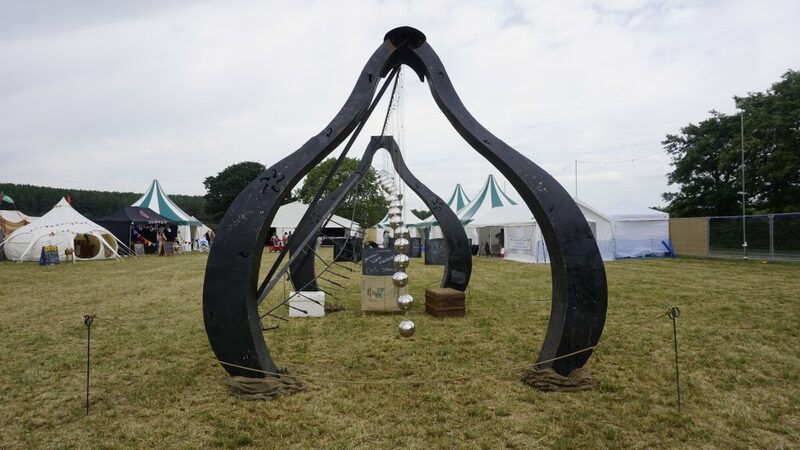 It is true, many festivals have childrens entertainment but there is probably more than it’s fair share here with no end of diablos, stilts, optical illusion constructions and storytelling to keep the little ones entertained. None of the entertainment seems like an afterthought either. Through the weekend we hear the countdown of entertainers about to release a giant Newton’s Cradle, or see the crypt-keeper doing his rounds ushering families for the night-time spooky tales. 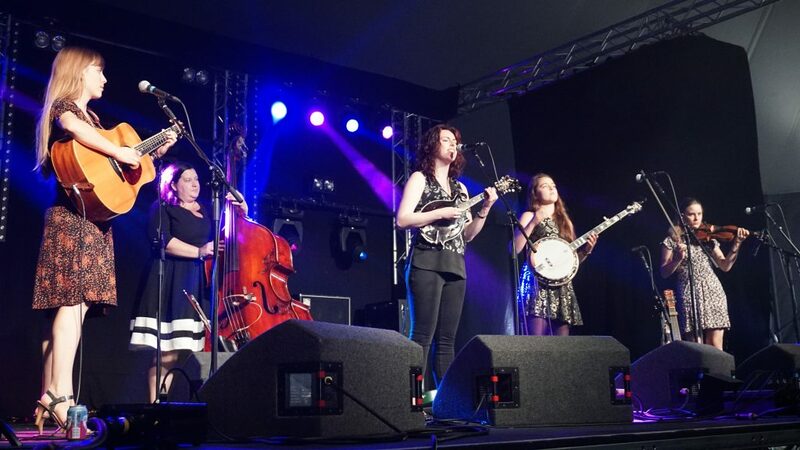 There is more all-round entertainment for families then I’ve ever seen at a folk festival anywhere, credit is definitely due for the Rusbys and their commitment to trying to make it a festival for everyone. Beer is free flowing, and there are more than enough places to indulge in food if you don’t bring your own, our favourite being the “Massala Chips” that are on offer from a vendor here. 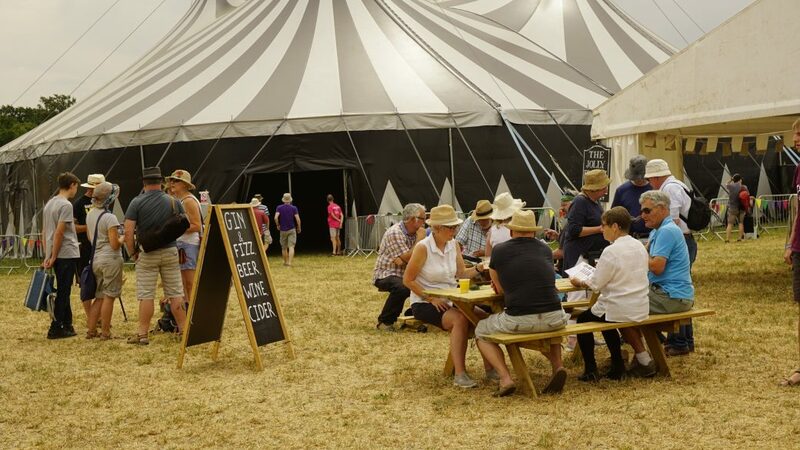 Whilst being fairly large in size, the whole even is quite self-contained with festival venues being near the top, the workshop tent at the bottom and everything else in between. Colourful and picturesque, we cannot really ask for better surroundings. That is all well and good, but what of the music? Well there is so much, it is hard to know where to start. Let us tell you about a few of our favourites. Starting with Maya Youseff. Arriving on the third day like a hungry tiger waiting to pounce, Maya Youseff is here, but she is not alone. There is her band, but also an unexpected, ethereal sound drawn straight from her homeland that brings a positive World vibe which widens the scope and sound of the whole festival. Youseff is from Syria and considered the “queen of the quanun”, her 78 string zipher whose playing is usually dictated to be a man’s occupation. Breaking the mould in performance and sound, Youseff performs from an ethical standpoint, the desire for peace in Syria. She achieves this through a kind of waterfall of sonic beauty. Having played Womad the year before she brings her unique talents to South Yorkshire. There is a lot from her set to enjoy. Of course she plays the number that started her leap into music with her most famous song “Syrian Dreams” a reflective tune that builds to a plead for action and an almost broken dismayed finale. It is something special but there is more. Her song “Hi Jazz” is an audio experiment into different chords and melody that shows the quanun’s versatility in playing and sustaining a tune that takes less influence and pointers from the Middle East with great success. Another favourite if ours is “Breakthrough” with a kind of sound that maps and shows inspiration and the barrage of ideas as they converge and deepen. It is all impressive. Her songs of peace culminate in the “7 Gates of Damascus” a series of interludes that together formed a soundscape of these Damascus portals. There are shades of personality within each section be it the steadfast Kisan Gate, the much more watery Gate of St Thomas and also the “Gate of Peace” with several short sharp strokes like gleaming jewels in the sand. A delightful set and a wonderful addition to Underneath the Stars. See her website here https://mayayoussef.com/. Showing it’s commitment to star power and interesting celebrity, Underneath the Stars invite the acclaimed author Joanne Harris along to the weekend, and lucky for us she accepts. Widely famous for her work “Chocolat” she has written and conceived of several other multi-genre novels, Twitter-writing projects, and now she has turned her expert hand to music. The set can easily be described as myth with a cloak of “prog rock” which is little surprise given the bands personal friendship and history together. Harris herself calls it “Jackanory with drums.” We can’t refute her logic, there are a great selection of stories she draws on here and it is quite jaunty and forlorn in the way only flute led forest tunes can be. Whilst this is the case the overarching tone and character probably can be more likened in it’s musicality to the War of the Worlds. You aren’t waiting for the interrogative violin slap of that signature tune, but maybe one or two martians made it through the British military’s defensive line this time. This is no bad thing rather it is an interesting choice. Inventive and powerful, the Storytime Band are one to check out if they are in your area. Check out Joanne Harris’ website for more information http://www.joanne-harris.co.uk/. All dressed smartly in a row, it is possible that many audience members are uncertain of what is to come (my partner is incredibly sceptical). The Ukes are pretty much exactly what they say they are after all, an orchestra of ukuleles but this factor alone is not what makes them brilliant (as unique as it is). It is rather they they cover songs that are instantly recognisable with the gusto and flamboyance of a Spanish Bullfighter making bread to tune. The comedy starts with them describing the vast array of tuned ukuleles in their repertoire (hint: they are mostly tenor) and it just continues to climb from there. This knowledge doesn’t really prepare for the onslaught of comedy and musicianship that is to come your way. These small instruments and their performers become epic in size as the evening ticks over and emotions run high. Some of our favourites include their rendition of “Life on Mars”, “Born to be Wild”, and “Sweet Dreams (Are Made of These)”. Sprightly in sound like a drove of hares, the Ukes commanded the field, tent and all surrounding area as they remind you of great songwriting in the ukulele style. We had seen snippets online of their performances, after all, they have played the highest echelons of arenas such as Sydney Opera House, Carnegie Hall and the Royal Albert Hall, but even the grandiosity of the sound and image on screen does not come close to the atmosphere of the live performance. Consummate and legendary they are an exceptional act for this Barnsley festival. 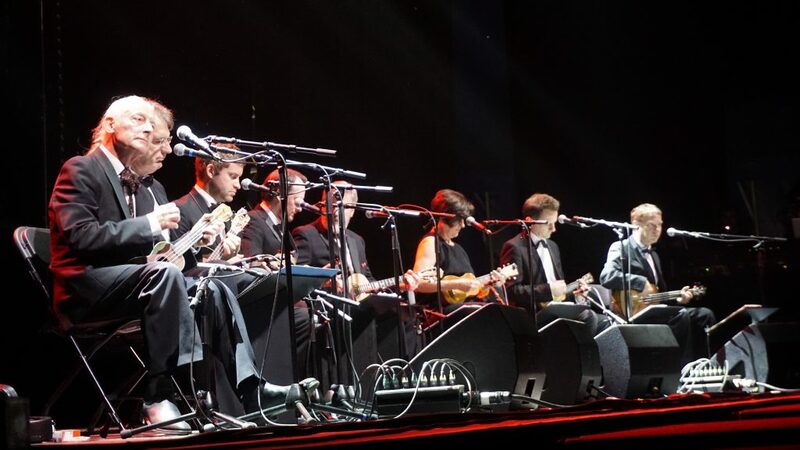 Their website is here https://www.ukuleleorchestra.com/index.php/. As fiery as the efflorescent arcs of heated coals into a train engine, Midnight Skyracer are a fine set of plans for a bluegrass night as any you can imagine. At “Underneath the Stars” they were part of the afternoon entertainment.. and entertained we were. Like an unstoppable but non-menacing juggernaut (maybe a mystery red setter running at you rather than an Alsatian), Midnight Skyracer were on point with delightfully sun-bleached lyrics, tremendous instrument skills and a chamber of sound that confidently shakes the most obscure mountain man’s hut. Their songs ranged from quintessential Blues romps (Working Girl Blues), to Bluegrass-RiotGrrrl song “So Long, Goodbye, We’re Through” with dizzying banjo plucks and a refreshing story of how a song transformed from being a potato to a cow who is rode like a horse (Virginia Rose). Yes the integral Kate Rusby is performing during the festival, and she is fantastic. There is also a surprise appearance by Jason Manford and together they truly bring the house down with “Falling Softly”, a song from Manford’s album and a track from the musical “Once” (a love story set in Dublin). 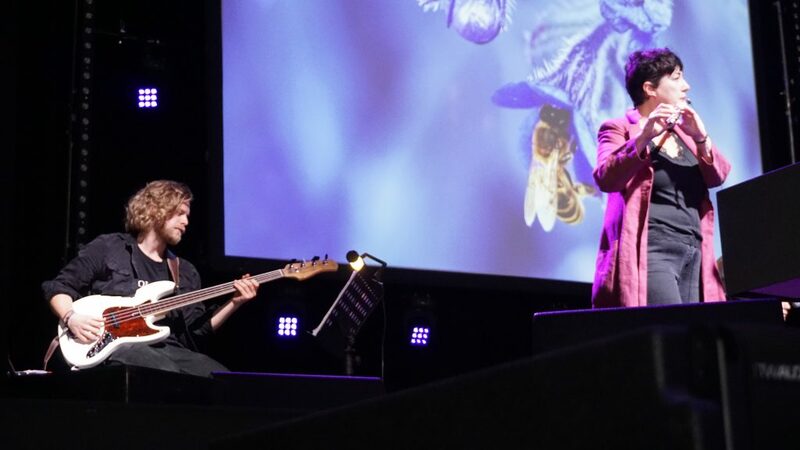 There was also an opportunity to hear fan favourites “Big Brave Bill” (Barnsley’s superhero of choice) and the eponymous beautiful and completative “Underneath the Stars” amongst many others from Kate’s extensive discography. A personal and consummate performer you can’t help but smile at Kate’s energy, and this is why we were especially interested in the “cosy chat” portion of the weekend where Kate Rusby & Sally Smith came back (by popular demand) to talk about their friendship and looking fondly back on early experiences with music. It is all very real when Kate plays a tape of an especially sad song about kissing the lips of a dead soldier (that’s how we remembered it anyway) as part of a school project. The slot moves on around her (at the time) questionable fashion (a pair of massive trousers they both stand in being something else indeed), it is all very relaxed and cool and welcoming. At a few points Kate is joined by the band and husband Damien O’Kane as they thrash out some songs. At these junctures, friend Sally entertains massively here with her tin whistle interjections and well-meaningness. Light-hearted and cheeky it’s a warming mirror to the spirit of the festival and a good showcase of what it is all about. We could go on all day (we won’t we promise), so let us quickly run through some of the others that caught our attention. There is of course the prominent, significant and mind-dwelling set of Lau alongside their Moog instrument “Morag”, a group so inventive and cerebral they seem to pierce the veil of musicality itself. Also the enigmatic yet grounded Martha Tilston, quiet and contained “Pitou” and Austarians “L-R” who in their grand percussion seemed to attract the biggest and most dedicated following for a newer artist that we saw over the weekend. There is also Andy Kershaw’s sage and funny advice from the world of showbiz (with some Alan Bennett impressions thrown in), Estebel’s excellent European Folk wanderings, Jack Rutter’s faithful folk leanings, and one of our favourites “Melrose Quartet” shaking up the festival with their exceedingly polished, reaching set around the successful “Dominion” album. Credit should also be given for Jack Harris a long time supporter of the festival, compere and performing with an honest, gritty and talented acoustic set. All-in-all a success. A very family-friendly event, a safe site, and excellent music taste by the Rusbys here. If festivals were animals, then “Underneath the Stars” would be an emperor penguin standing tall and confident, yet humble in it’s achievements and offer. If this is not enough, check out some of our sample videos from the festival below. NOTE: I do not copyright or ownership of given performances and music below, they belong with the respective owners. I do not claim income from said material. Any artists wishing for use and copies of the source files for their own promotion and use, please email me at reviewer@folk-phenomena.co.uk and I can send the original recording for your own publicity and artistic endeavours.